Syrians stream from their war-torn country into Iraq's Kurdistan region. 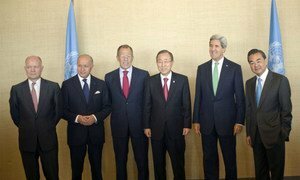 At United Nations Headquarters today, members of the Syrian National Coalition, a major opposition group, were told that they had critical roles and responsibilities in negotiating peace and fostering democracy, and helping to preserve the unity of their strife-torn country. “The Coalition has a key and central role to play in making Geneva II a success,” the group was told concerning the peace conference now under discussion, in a message to the Ministerial Meeting of the Friends of the Syrian People which was delivered by Oscar Fernandez-Taranco, UN Assistant-Secretary-General for Political Affairs. Reaffirming Secretary-General Ban Ki-moon’s position that the only way out of the devastating crisis was through dialogue and political compromise, he said that the Geneva Conference on Syria, which the UN has been working to bring about for months, is meant to launch such a dialogue. He said that yesterday ministers of the five permanent members of the Security Council agreed to work together and separately to make sure that the Syrian participants come to the Conference to negotiate in good faith. Tomorrow, he said, the Secretary-General and Joint Special Representative Lakhdar Brahimi will continue this dialogue to see if, on the basis of all the consultations that have taken place these past few days, a date can be set for the Conference. He said no one was naïve to the challenges of ending the conflict peacefully, given that some in Syria did not share the vision of a unified and democratic country that protected the diversity of its people and rejected extremism. In the face of such challenges, leaders must make tough choices, he said. “The Syrian people have suffered enough. It is time to put aside our differences and take diplomatic action,” he told the meeting, which was held on the sidelines of the high-level debate of the 68th session of the General Assembly.